In this case, the Desert Mounted Corps Routine Orders for October 1917 have been highlighted to illustrate the tempo of this formation from the beginning of October towards the end. The aim is to illustrate the implementation of the Allenby Offensive that began at the end of October 1917 with the capture of Beersheba. 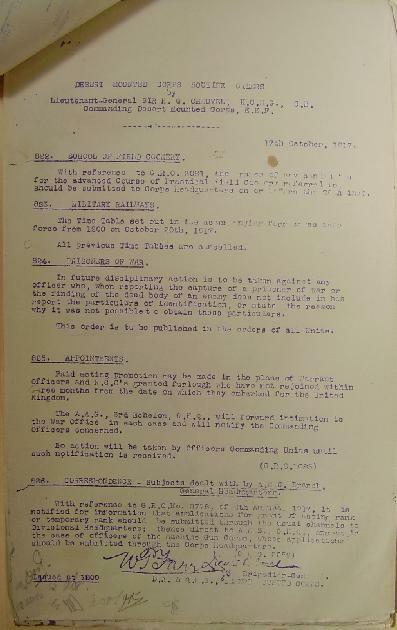 Desert Mounted Corps Routine Orders, 17 October 1917, p. 1. Of interest are the initiallings at the bottom of the page. It indicates order and precedence amongst the staff officers commanding the Desert Mounted Corps.